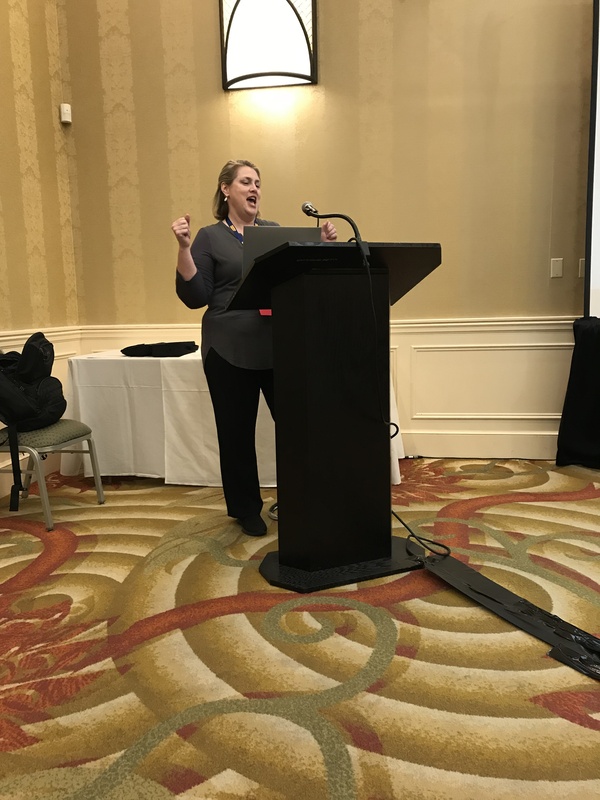 In my last post, I covered my general experience at the New York State Family History Conference. This time I will be writing about highlights from the classes and talks I attended. Friday was opened by a “plenary session” (which I had to look up: it’s the big meeting that everyone goes to). 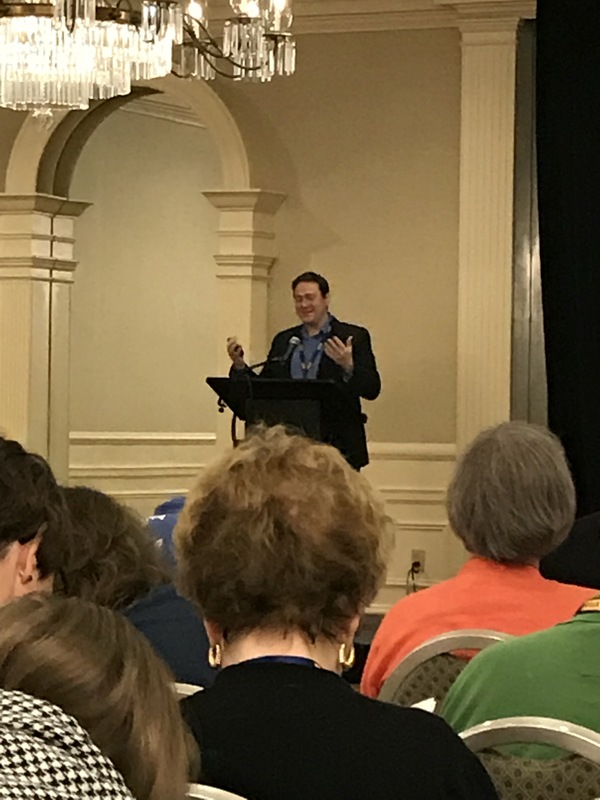 Joshua Taylor, President of the New York Genealogical and Biographical Society, officially welcomed everyone to the conference. He gave out two awards: the “Empire State Service Award” to Jennifer Liber Raines and the “Professional Service Award” to Susan R. Miller, for all her hard work at the conference. Joshua then announced a new project that NYG&B was spearheading: the New York Land Records Project. This project involves the indexing of New York state land records on FamilySearch, a huge undertaking considering New York’s historic population. Click here for more information if you want to get involved! President Joshua Taylor addresses the crowd. Author’s collection. We were then introduced to the session’s main speaker, David Nicholson, head of Living DNA. David introduced the team members who came with him: Katie Welka from Canada, and Diahan Southard, who cartwheeled her way up the aisle! David spoke of Living DNA’s hopes to make DNA analysis more intuitive and more interactive. Some of their future tools are still in development, but look pretty exciting and accurate! Keep your eyes on this company! Knowing how MyHeritage is usually on the cutting edge of technology developments in genealogy, I signed up for their Saturday luncheon talk, “Genealogical Records in the Path of Destruction & Neglect – Past, Present & Future” by Mike Mansfield. Mr. Mansfield basically reviewed the well-known devastating losses (i.e. the 1890 Census) over the course of history, as well as data losses due to changes in languages, culture and technology. He made the very valid conclusion that each of us should be sure to document our own records and family history and to share it with others. Free Irish Catholic records! Author’s collection. There are lots of new records coming online onto Findmypast. Jen is working hard with diocese all over the country to get records online. Catholic records from Ireland are free with a free account. If you’re a member of the NYG&B, Findmypast North American records are free! This was a sampling of museums, libraries, historians, and special collections, most of which Jane had visited herself. Philip is from the New York Public Library. The Map Division is in Room 117 at the main library, but there is a LOT online! Philip demonstrated NYPL’s Map Warper, which is a really cool tool! Frederick showed us some common and uncommon map tools: Google Earth Pro, Arcgis.com (a paid site), GNIS. Be familiar with the historical area before you research the map. Research trip tip: note repositories on your online map software. 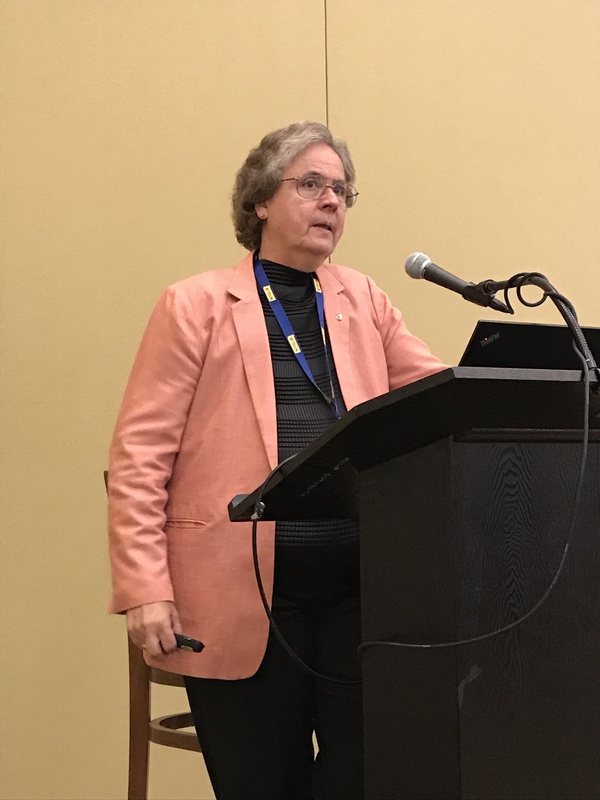 The Legal Genealogist, Judy Russell. Author’s collection. Besides FindaGrave and BillionGraves, there are many great resources online: the WPA Grave Index on FamilySearch, genealogy societies, US GenWeb, African American Cemeteries online, US Department of Veterans Affairs, American Battle Monuments Commission, Cyndi’s List. Blaine made the relationship between these two concepts so much easier than it sounds. DNA provides direct evidence of a genetic relationship and indirect evidence of a genealogical relationship. If DNA is not available for whatever reason, consider it a “burnt courthouse”. Cherie Bush is psyched to share with us! Author’s collection. The biggest message: use the Catalog! A great jumping-off point for immigration is the Ellis Island/Castle Garden blog post. took 4 pages of notes! Terry said that the best resource to start with was the NYG&B Gazetteer. Documentation is not just the product, but the process as well. The essence of documentation is: the who, what, where in, where is, and when. It’s important to know that that the New York State Archives & Library had a devastating fire in 1911, though some records and some partial records were saved. The NYS Archives seems to be organized much like NARA: each record set has a series number. By the end of the conference, I was spent! But it was so worth it. The next NYSFHC will be September 10-12, 2020 in Albany. Will you be there? When I first heard that the New York State Family History Conference (NYSFHC) was going to be in Tarrytown, NY in 2018, I said to myself, “I’m going!” and I kept a sharp eye out for details to be released. After all, it is within driving distance from my house – all I would have to pay is the conference fee! Finally, the conference arrived on September 13 – 15. I didn’t sign up for any pre-conference workshops or tours, but I was okay with that. 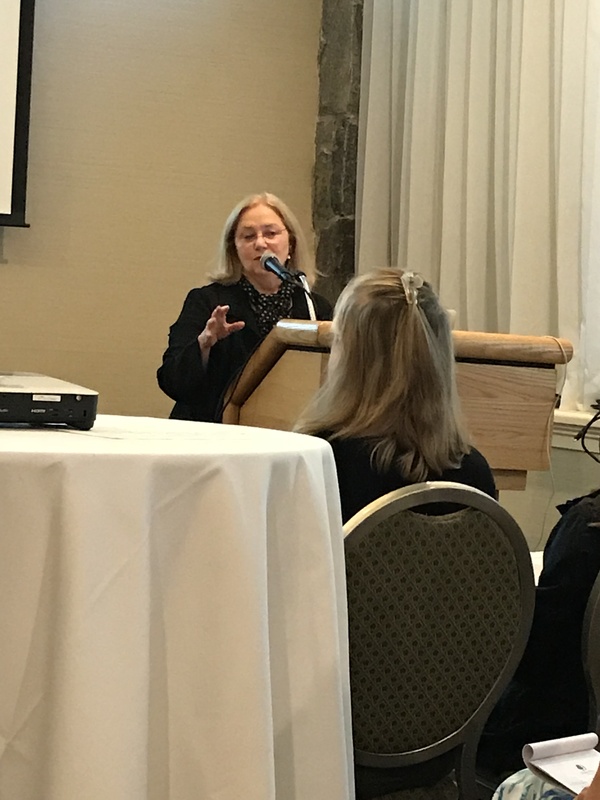 NYSFHC, put on by the New York Genealogical & Biographical Society, was held at the Doubletree Hotel in Tarrytown, right along the Hudson River (and I did not take time to take in the views, but I’ve seen the river plenty of times). For those who attended NYSFHC and stayed in the hotel, I’m sure it was super-convenient. The hotel had its own restaurant, but it seemed to me (the one time I ate there) that it was not used to handling a conference crowd. There were no other restaurants located conveniently nearby; having food trucks would have been fantastic! The space that the conference was held in was sufficient. Classrooms were (usually) not too crowded, though for the smaller rooms you had to get there early enough to ensure you had a seat. A couple of rooms were either too cold or too warm, but this Goldilocks was prepared by wearing a blazer! The main exhibit hall was a bit crowded at times, but there was always the option of checking out the exhibitors/vendors out in the hallway. You’ll read in other blogs that the unique part of a conference experience is interacting and networking with others in person. That is so true! I was feeling a little shy when I first arrived, but then I reached the exhibit hall and saw Jen Baldwin at the FindmyPast booth right away. She recognized me immediately from when we met at the Global Family Reunion and greeted me with a hug! 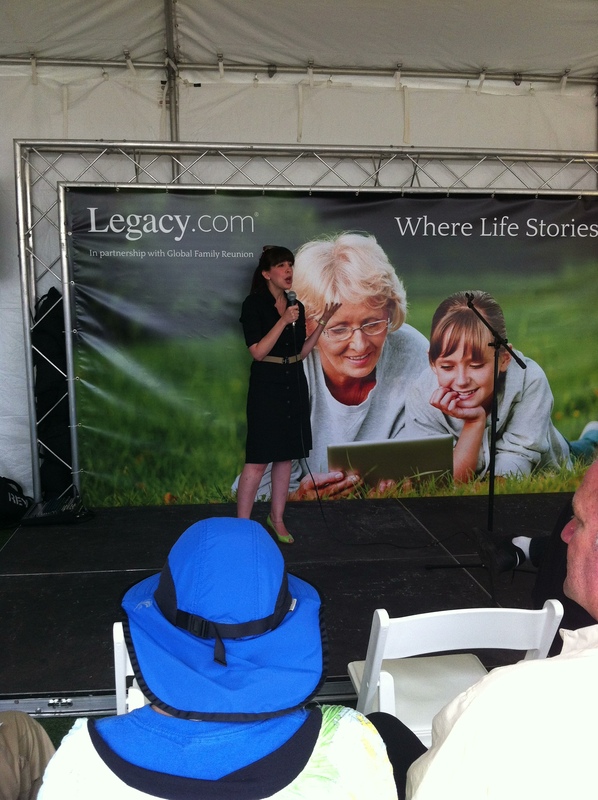 Once again, the FindmyPast booth was a great place for home base. Jen Baldwin at the Findmypast booth. Author’s collection. 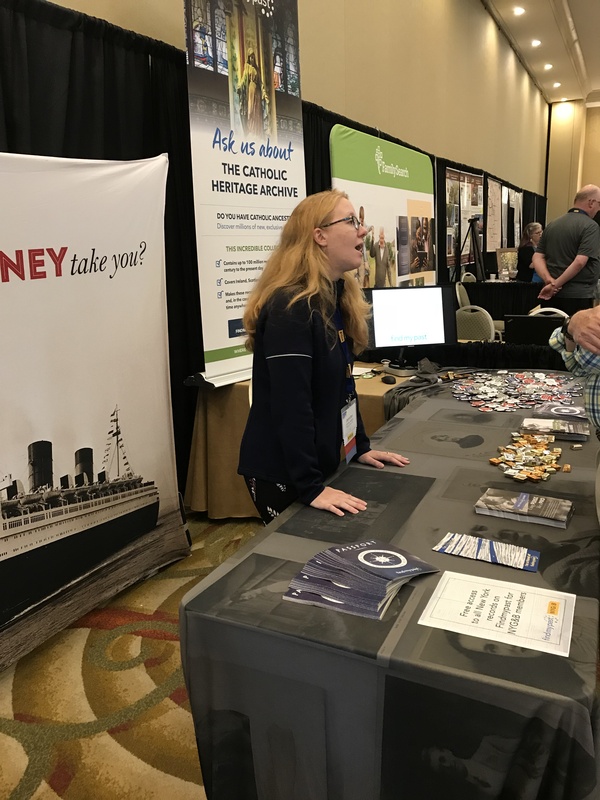 Another touchstone was the OldMaps booth, where fellow Virtual Genealogical Association member Sara Campbell was handing out VGA ribbons for our badges. 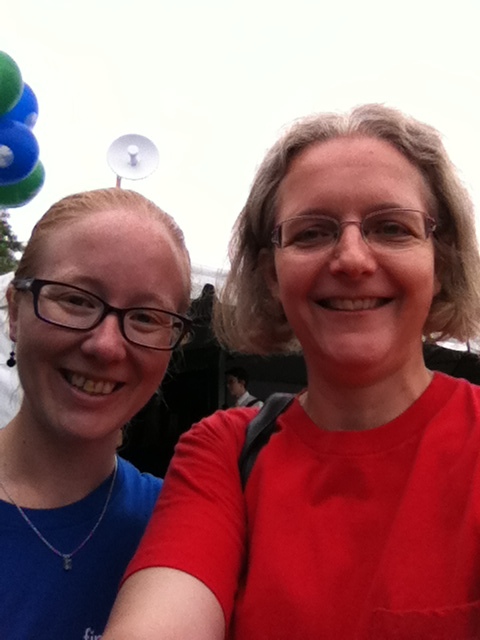 Little did I know, I’d actually met Sara two years before at a New England geneabloggers meet-up! At NYSFHC, I was tasked with taking a VGA group picture (which turned out to be two), and Sara helped redirect members outside of the exhibit hall for the pictures. Meeting some of the other VGA members (Susan Schuler, Kim Cotton, Gail Gannotti, Carol Poulos, Karen Ramon, Ellen Healy, Jo Henn, Eva Kujawa from Sweden, and Marian B. Wood, who I’d heard speak a few months before) was awesome! Contrary to the conference being New York-based, these folks were from all over the world! And here we were, virtual members meeting together in person. 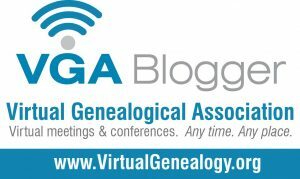 Virtual Genealogical Association meet-ups. Author’s collection. But of course, I was most excited to meet up with my peeps from #genchat – complete with the #genchat selfie sign, created by Jenna Mills! There were a few people I knew would be there, based on Twitter feedback (like Jen & some VGA folks), and others that I was pleasantly surprised to see, like Molly Charboneau (who I met at the 2014 Genealogy Event) and Michael Cassara (aka @digiroots). Ironically Friday night was also a #genchat night, so meeting at the conference was a nice reminder to everyone that #genchat was still around! Jen Baldwin, and me with Jen! Author’s collection. Molly Charboneau and Michael Cassara. Author’s collection. Susan Schuler and Kim Cotton. Author’s collection. Diahan Southard and Marian Wood. Author’s collection. Now, I know that at conferences, you get ribbons to put at the bottom of your badge, but I didn’t know much about how you got them or why. 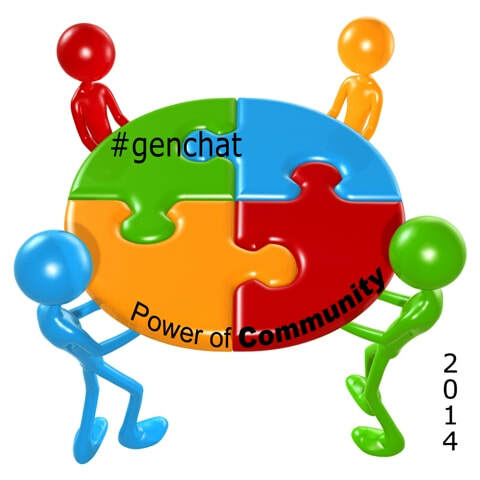 I did have #genchat ribbons to give out to the #genchat folks, and I knew I was entitled to a VGA ribbon. I picked up a few that I knew I qualified for. (One guy I spoke to thought that I was a professional since I had “so many ribbons.”) What I didn’t know was I could actually get a lot more! I found out from Jen via Twitter that “Ribbons are essentially free marketing… of course we all want our logos carried around by attendees and on social media. So in most cases, it’s a free for all. Each attendee can choose to be a part or not.” I guess if you’re in doubt whether or not you can have a ribbon, just ask! In my next post, I’ll be highlighting the talks I attended and what I learned. 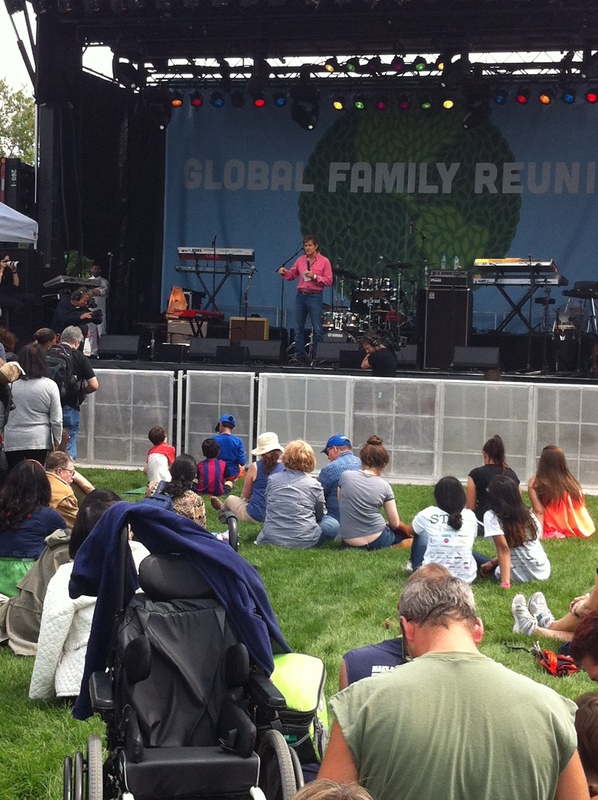 Yesterday, June 6, the Global Family Reunion was held at the New York Hall of Science in Queens, NY and I got to go! Because it was so close to where I live and the price was right, I figured I should take advantage of the opportunity. If you follow me on Twitter, you got to see a lot of comments and pictures! Let me first tell you how the day went for me personally, then I’ll give you my overall impressions of the event. First of all, it was quite easy to get to. I just took Metro-North into Grand Central (about an hour), then the 7 Subway over to 111th Street (about half an hour), then a five minute walk three blocks away. Although I wasn’t overly impressed with the neighborhood, I realized it was just an urban working-class area. 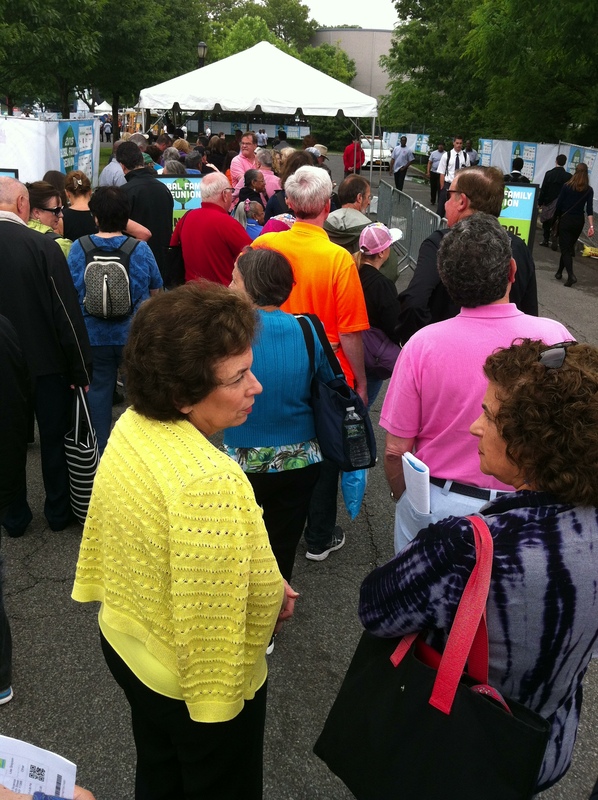 I arrived about 10:45am and immediately made friends with new “cousins”/genealogists in line, one being from Chicago! It took past the scheduled 11am start time to actually start checking people in, and I’m still not sure why. We were directed to the “Cousin Check-in” area, which had two lines; apparently I was in the wrong one, and the other was very long, so I said to myself, “I’ll check in later!” (which I did). Waiting to get in. Author’s collection. #genchat friends: Jen Baldwin and me! Author’s collection. obligatory selfie. After that, the Find My Past booth was sort of “home base” for me throughout the day. on the website, so AJ Jacobs was not first up, but close to it. 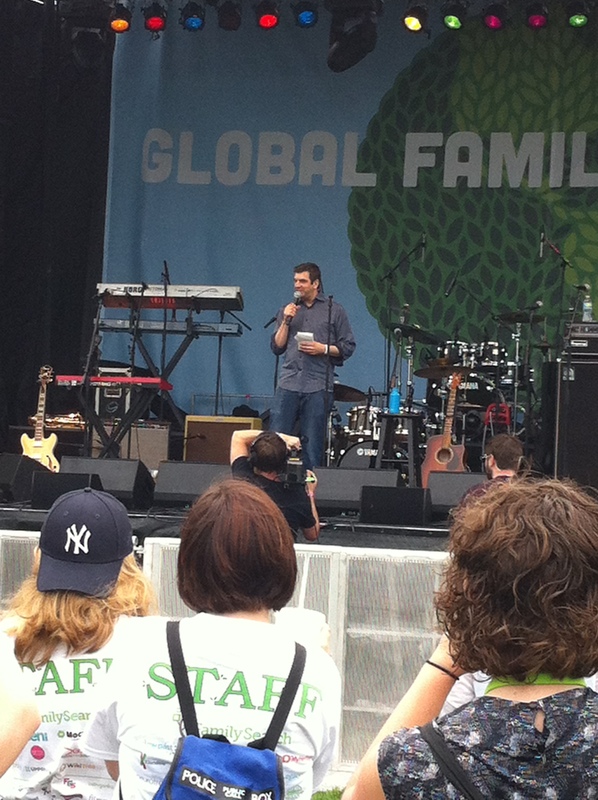 He apologized for the delay, saying we could forgive him since he was family, and gave us a hearty welcome and a little speech as to the Global Family Reunion came about. Not able to decide what to eat, and still not terribly hungry, I downed an old-fashioned New York pretzel and went to the Theater area so I could catch Henry Louis Gates. Alas! The 300-seat auditorium was completely full and I couldn’t get in. Not to be deterred, I put in my earbuds and accessed the live webcast of Mr. Gates as I sat in the sun (which fortunately finally came out). Basically, he spoke of his background and how he ended up being a genealogist. The most exciting part was announcing his plans to help get genealogy into the classroom in science (through DNA) and social studies, starting with the inner city first (as they stand to benefit the most from it). Keep your eyes peeled for more on this development! I spent a little time wandering around before catching D. Joshua Taylor (one of the hosts of “Genealogy Roadshow”, among many other roles) talk about Genealogy & Hollywood in the Viscusi Gallery room. Josh sure has a way of presenting! Not only did he tell us some neat things about genealogy and entertainment (such as the fact that Walt Disney made sure all his characters had a family tree), but he also drove home the fact that we must verify our on-line findings. motivates us to change, particularly from the perspective of staying healthy so we can enjoy our families. Finally hungry, I had the biggest Falafel sandwich ever (delicious and filling for the rest of the day) as I watched the goings-on in the kids’ area. Boy, they were having lots of fun! 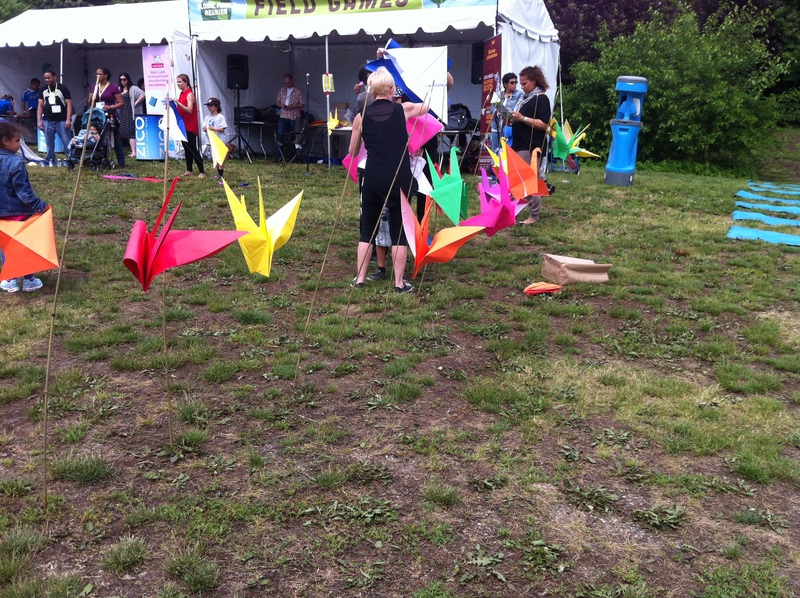 Kicking soccer balls, hula-hooping, origami folding and other games. As I tweeted, I didn’t see one whining, crying kid. They were having fun! Older children and teens sharpened their storytelling and writing skills in the Storytelling Tent, and if that wasn’t enough, families got to play miniature golf or explore the museum itself (which looked pretty interactive and cool). Paul Williams had just enough time to sing “The Rainbow Connection” before he had to leave. It was cool to see him, as I remember him from “back in the day”! Later on, I even got to meet Daniel Horowitz, Chief Genealogy Officer from MyHeritage. He was happy to hear that I was a MyHeritage user and I was happy to hear that he was able to find some family graves nearby in Queens. Tammy Hepps, founder of Treelines. Author’s collection. had given this talk during RootsTech, and I wanted to see what new developments she may have uncovered! (Needless to say, she learned a whole lot about margarine!) I also got to say a quick hello to her. 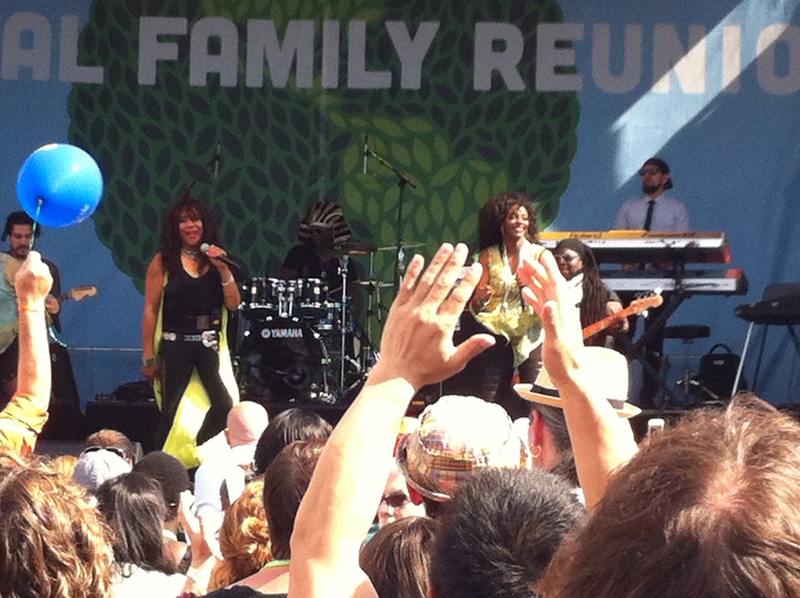 Sister Sledge sings! Author’s collection. started: “We are family!” everyone sang. The music, the joy, the hands holding up “I Am A Cousin” signs! I don’t think I’ve ever seen so many happy, celebrating people in one place at one time. 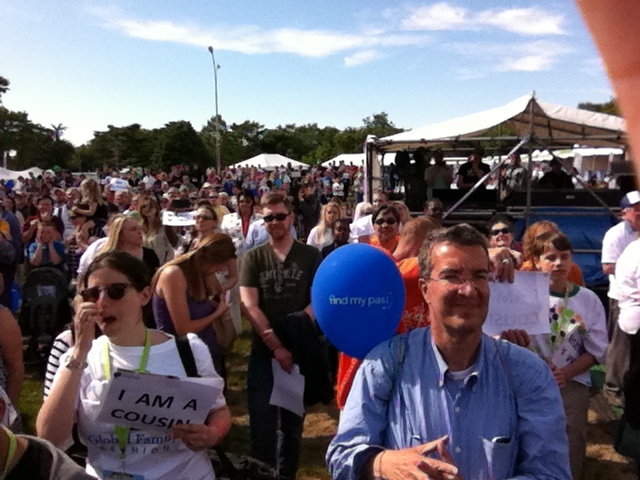 Just part of the crowd! Author’s collection. Finally, we “posed” (?) for the big family picture and we listened to AJ’s lovely wife Julie talk about the fundraising portion of the event: supporting Alzheimer’s research and care. AJ was also given several bits of recognition, including an honorary membership in the New England Historic Genealogical Society and a double-helix guitar (which did not make it to the stage, but he promised he’d post a picture of!). Afterwards, I went back to the Viscusi Gallery to hear Randy Whited speak on “The Future Is Now”. He spoke of everything from advances in technology to telling our own story. My favorite point was to make it obvious which part of the story comes from us versus which part comes from records (another score for well done genealogy). 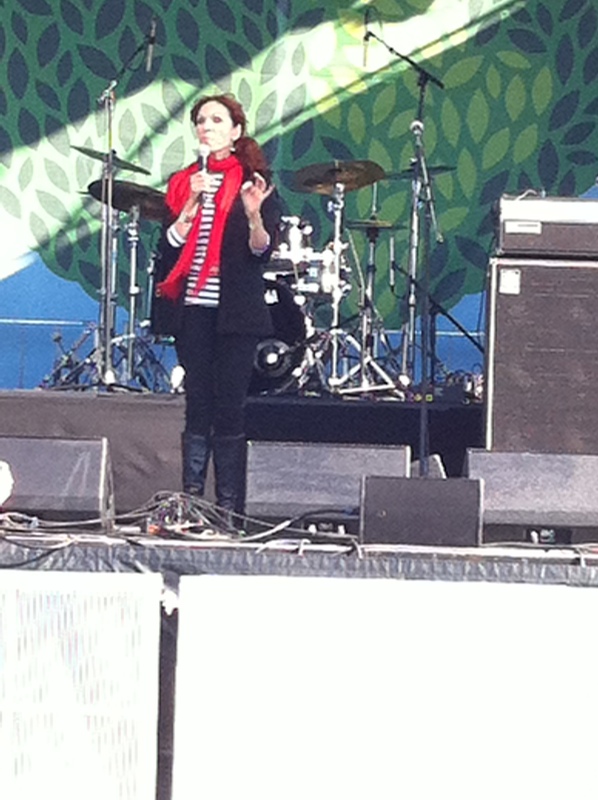 Marilu Henner, memory extraordinaire! Author’s collection. our memory recall (important in light of the focus on Alzheimer’s). One big tip I remember was using your primary sense to tap into memory: if a visual person, take pictures; if tactile, write it down, etc. What will I remember most from this talk? Her scolding the chatty security guards backstage for being too loud while she was talking! Ha, ha! Me, Jen, and Josh Taylor. Surrounded by genea-awesomeness! Author’s collection. honor of snapping the official Find My Past team photo! Said goodbye to Jen, until we “see” each other virtually again! One screwy thing about getting back: there was no Manhattan-bound train from that subway station that weekend! It seemed we had to take the train to one stop up (where the Mets play), then take a Manhattan-bound train back. 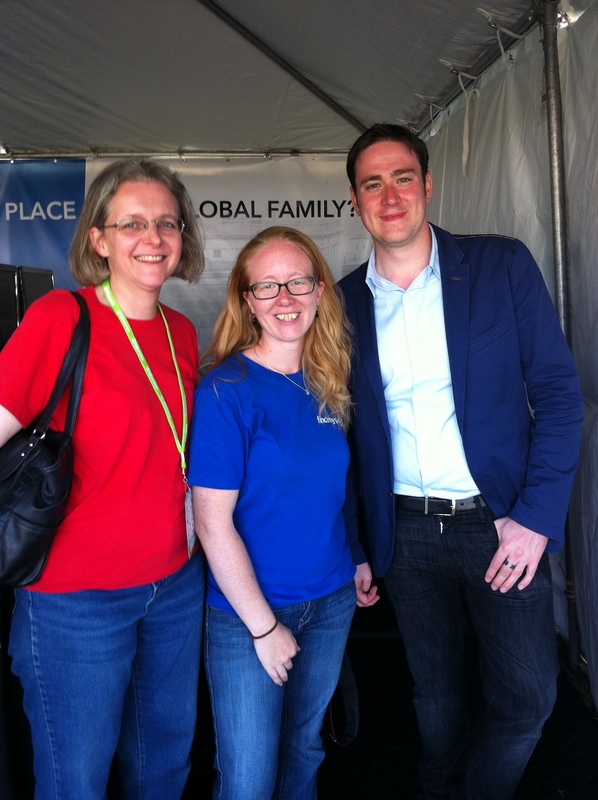 But this turned out to be a good opportunity, because I met some other genealogists (cousins!) who were headed back as well, and we got to talk about the day and our favorite online people (DearMYRTLE and Michael Lacopo were theirs). When it comes to genealogy, there are always friends to be made! 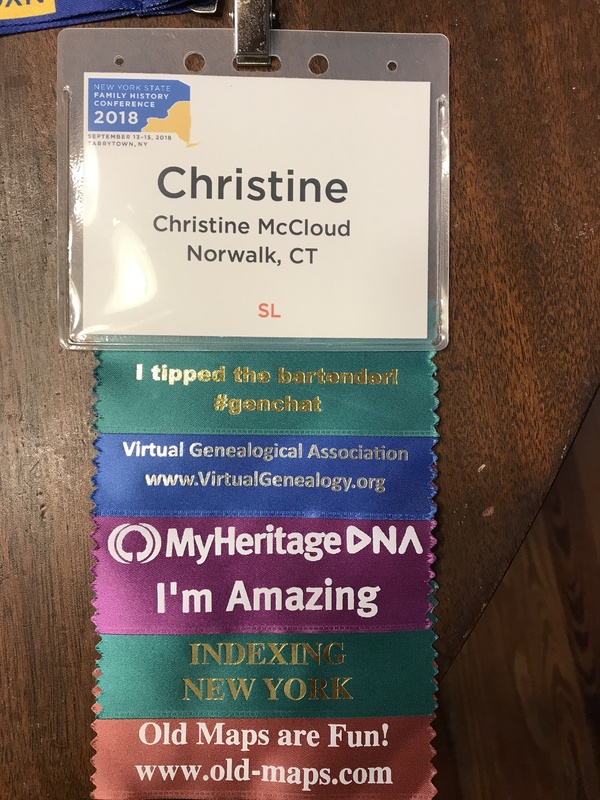 the genealogy tents (Find My Past/Mocavo, Family Search, and MyHeritage/Geni) were hopping with people who wanted to make discoveries, and they did! good genealogy speakers, placed in the right rooms (for the most part), with topics designed to capture your interest if you’re new to genealogy and to encourage you if you’re not. It was sometimes hard to choose who to hear speak! coffee. There was no coffee anywhere. We need coffee! proper signage to direct folks to appropriate lines. When entering, there was a line for VIP’s and General Admission, but it was hard to tell which was which. Also, at Cousin Check-In, they needed signs for those who had sent in their family history info and who didn’t. It was kind of like being at the DMV. more volunteers at the entrance gate and especially Cousin Check-In. I wish I could have seen Henry Louis Gates; he was obviously the biggest draw there. If he didn’t have slides, I’d suggest he should have gone on the Main Stage. Overall, a good time and worth the money. Next time, I want to bring some friends to spread the fun! 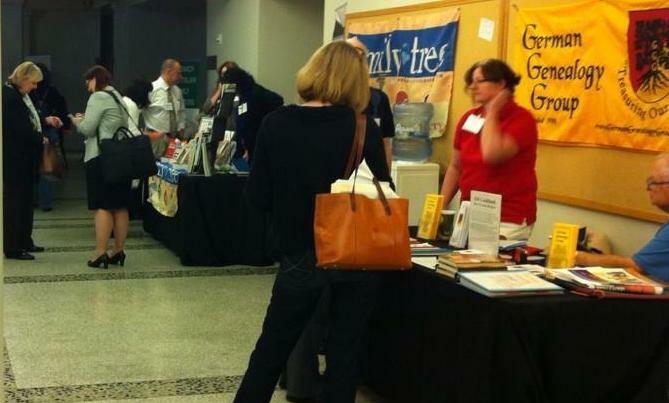 Another genealogy conference we can eavesdrop on together! This one is in St. Charles, MO and officially starts on Wednesday, May 13, but rumor has it that Library Day is Tuesday. Alas! Due to financial constraints, I wont be going to this conference that starts tomorrow and ends Saturday in nearby Providence, RI. 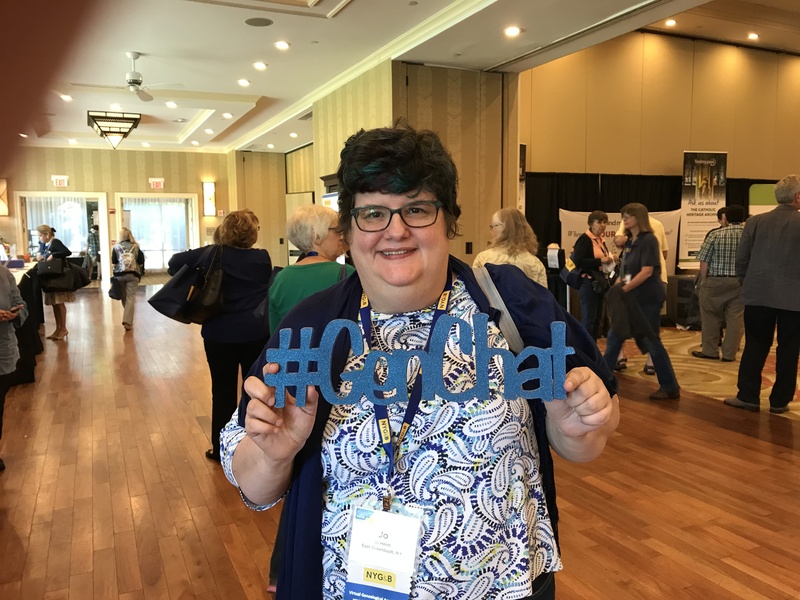 I would have loved to hear Judy Russell and Lisa Louise Cooke, meet up with genealogy friends, and even squeeze in some of my own research. 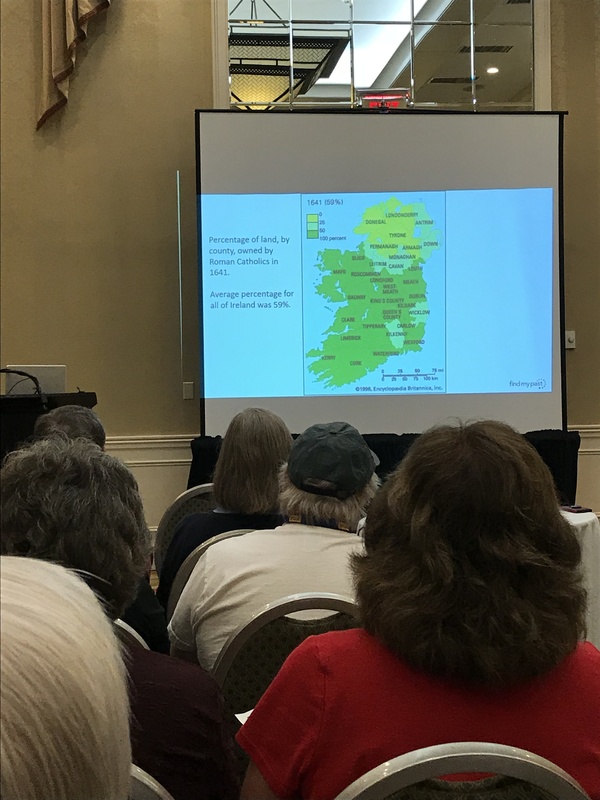 Today was DNA Day at The Genealogy Event, which I opted not to go to, since I’m not just ready to leap into that in my research yet. I still covered it the best I can via my RebelMouse page, so be sure to check that out. Meanwhile, I thought I’d reacap my experience and impressions of the third Genealogy Event. Where it was located: 1 Bowling Green is in lower Manhattan, practically at the tip of the island. All I had to do was take the train down to Grand Central, then the 4 or 5 line straight to Bowling Green. No searching for the subway station, no transfers;easy-peasy! Best of all? Starbucks was right across a not-too-busy street! 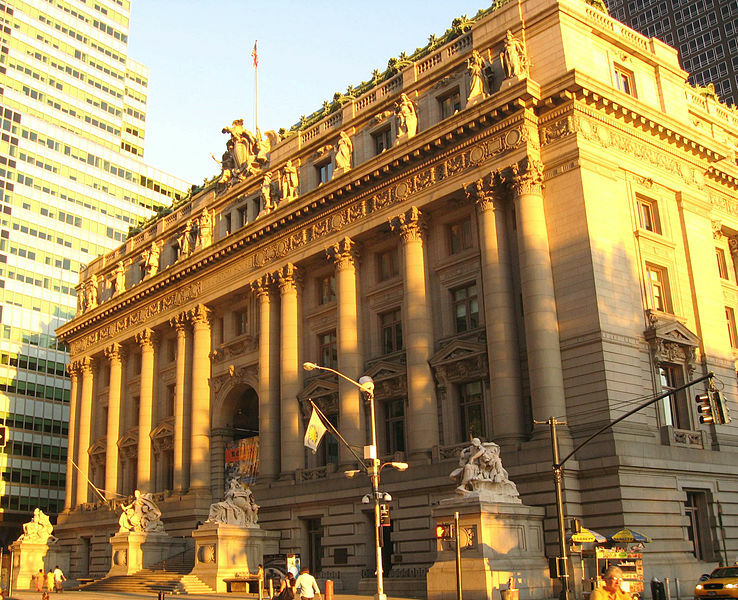 The venue itself: The Alexander Hamilton US Customs House is an absolutely gorgeous late 19th/early 20th century building. The architecture inside and out was stunning, as well as beautiful artwork painted on the ceilings of the most public areas. I could have spent all day looking at it, but that is not why I was there! So I’ll just have to satisfy myself with this link that our NARA tour guide recommended. By the way, this is a new office for NARA in New York City and it still doesn’t house their entire collection! To learn more about NARA in New York City, click here. Enclosed rooms: In the past, the Genealogy Event sessions were merely curtained off in a large, kind of echoing room. This year sessions were in separate rooms with doors that closed. It was so much easier to hear the speakers! Advanced Sessions: After last year’s little advanced break-out sessions, it was discovered that there was a big demand for more advanced offerings. I went to three of them: Reading Old Documents, Understanding Our Families, and Passenger Manifests. I learned even more than I expected to at each. New Topics for the General Sessions: Some of the topics that I especially enjoyed were Lineage Societies, Old Fulton NY Postcards, and Caring for Keepsakes. It was nice to have new offerings and new speakers this year. Lunch for VIP’s: One of the biggest reasons I signed up as a VIP this year was to have lunch on-site, which was in the Learning Center at NARA. It was a great place to eat, socialize or just to hang out if there was a long time between the sessions I was interested in. Social Event: This was at the Fraunces Tavern, where George Washington gave his farewell address to his soldiers at the end of the Revolutionary War. There is a museum here that I did not get to see, but now I know about it! Anyhow, it was nice to unwind and talk genealogy with others that share that passion! Meeting the Speakers and Other Attendees: Yes, I got to be a bit of a fan girl with some of the big names in the business! It’s a small enough venue where you can actually have a real conversation with the likes of Michael J. LeClerc, Maureen Taylor, Ron Arons and the ladies from Family Tree Magazine (and others, of course). I even had a family connection: Denise Levenick (aka The Family Curator) is very distantly related to me through our ancestor, Roger Williams. I made some new friends and finally met up with a fellow #genchat tweep: Molly Charboneau of Molly”s Canopy. Exhibit Hall: The exhibit hall was kind of scant this year, though I do understand it’s probably due to limited space in the hallway. I wonder if there may have been another meeting room to stick this in? I especially missed Maia’s Books from last year, although my wallet is probably grateful! Temperature in the Auditorium: The general sessions were held in the auditorium felt, quite honestly, sub-arctic. Even though I attended several general sessions in a row, I had to step out between sessions just to warm up a little. Handouts Available On-Line Ahead of Time: Several times, speakers would say “in your handout”, though there was none (yet). Perhaps having a special place so sign in and download (maybe with a code that comes on your paid ticket?) would be good. Wifi was Spotty: We were in the basement, so I don’t think a lot could be done about it. It just kept me from updating RebelMouse as quickly as I would have liked, but it was not impossible. As you can see, I did enjoy myself overall. I want to thank everyone for following along on RebelMouse; there have been over 700 views! I am humbled and flattered. I think one of the biggest things that I learned this weekend was that genealogists come in all sorts of shapes and flavors. Such a variety of skillsets and workstyle preferences! Even outside the classroom, I have been given a lot to think about. The Genealogy Event: Are You Going? This Friday starts the third Genealogy Event in New York City, and I can’t wait! There is a Starbucks nearby, the venue is stunning and historic, and I’ll be meeting people I know only virtually! Best of all, of course, I will be immersed in genealogy with like-minded people. Venue for The Genealogy Event. Photo courtesy Wikimedia Commons. And a few others as I am so led. 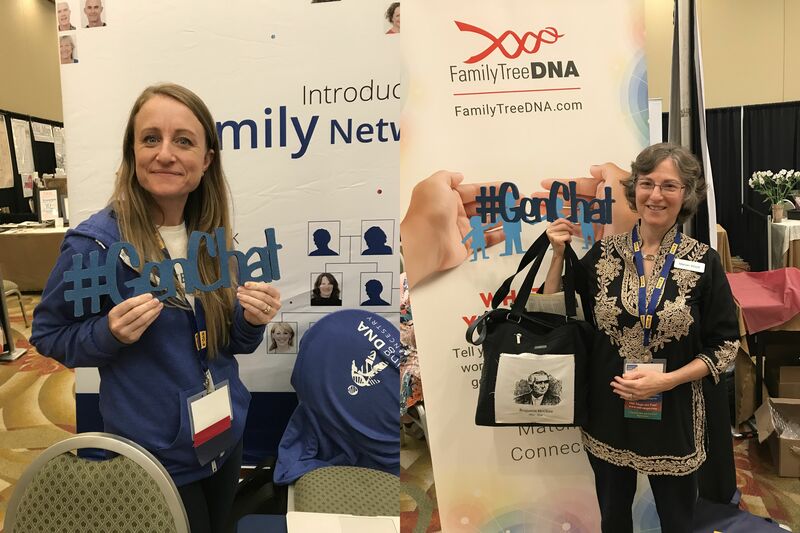 If you cannot attend the Genealogy Event, feel free to visit the Rebel Mouse page that I’ve set up, capturing the tweets and pictures of the conference. I’ll do my best to keep it as “live” as possible. If you haven’t visited Rebel Mouse pages before, I’ve found them to be very helpful in capturing the flavor of a conference; almost like being a fly on the wall! Of course, I’ll be writing a blog post afterwards to reflect on the whole experience. I hope to see some of you there!